We’ve long known about the virtues of the Trap Bar Deadlift. It’s essentially a Squat and Deadlift combined into one exercise. Trap Bar Deadlifts strengthen the glutes, quads and hamstrings. They also develop strong traps, back, grip and core muscles. It’s truly a full-body move. Based on a new research study out of Cal State Fullerton, it’s also one of the best exercises for improving athletic performance. Published in the Journal of Strength & Conditioning Research, the study compared the Trap Bar Deadlift to the conventional Barbell Deadlift. Twenty people performed three separate Deadlift sessions: A one-rep max using a trap bar; a one-rep max using a barbell; and three explosive reps at 65 and 85 percent of their max. The subjects posted similar maxes with the barbell and trap bar. As expected, the barbell caused greater muscle activity in the lower-back muscle and hamstrings, while the trap bar more effectively fired the quads. The barbell variation requires more muscle activation on the backside of the body, because the barbell is pulled from the front. With the trap bar, the weight is closer to the lifter’s center of gravity, which allows for a more vertical movement—hence its similarity to the Squat. The researchers found this small shift in position affects power production. When performing the 65- and 85-percent max sets, the subjects were able to produce more power by moving the weight faster than they could with a barbell. Power is the lifeblood of successful athletes. It allows them to exert high levels of strength in short periods of time, which is the foundation of virtually every sports skill, including sprinting, jumping and throwing a ball. Put simply, athletes who are powerful tend to be better athletes. So if you want to improve at your sport, add Trap Bar Deadlifts to your workouts. That said, Squats and Deadlifts are still fantastic exercises, and we don’t recommend eliminating them from your program. You just need to think about your goals. 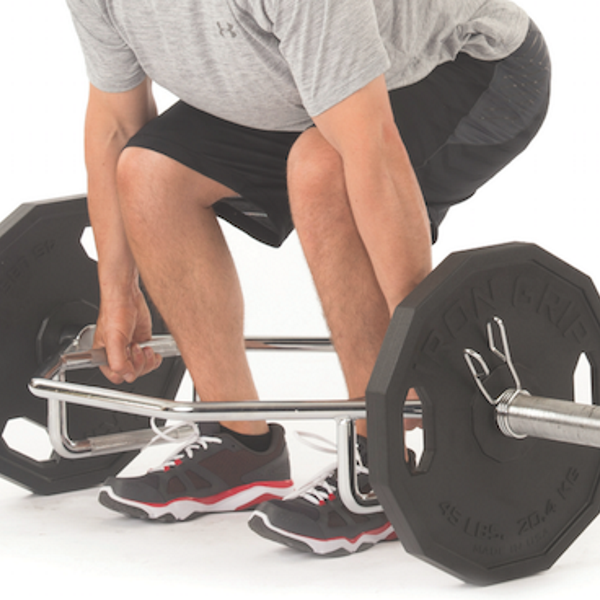 If you want to hit your hamstrings and lower back, the Barbell Deadlift is your best option. If you want to lift some heavy weight explosively, the Trap Bar Deadlift is among the best exercises you can choose.